The Canon ELPH 160 is an ultra-compact, affordable digicam. A 20-Megapixel imaging sensor and lack of OIS leave the camera capturing noisy images all the time. A perfect example of "you get what you pay for". Read more in our Full Conclusion. The Canon PowerShot ELPH 160 is an affordable new point-and-shoot digicam with a sub $120 MSRP. It is replacing the 135 model from last year. While it features the same 20MP CCD image sensor and DIGIC 4+ image processor from its pricier S170 IS sibling, it has a shorter 8x optical zoom lens (28-224mm) and only offers "digital" IS (image stabilization) rather than optical. The 160 also boasts 720p HD video recording with a dedicated movie recording button, and a 2.7-inch LCD display. Smart AUTO mode allows the camera to optimize itself for almost any shooting condition. And, finally, ECO mode helps extend batter life. 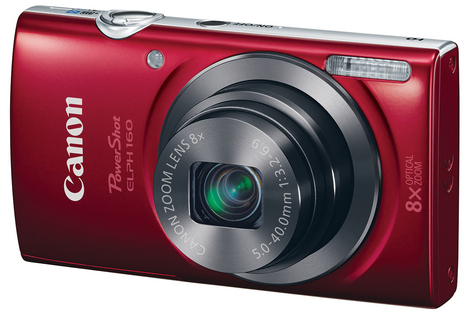 The Canon PowerShot ELPH 160 is available in black, white, silver, or red, with a MSRP of $119. See our best price box at the top right of this page to see current online pricing.